Write out W w on the primary-ruled lines and then color in the picture of the wolverine and the witch. 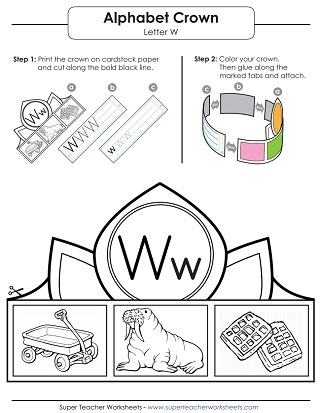 Assemble and wear this wonderful headband after you color the pictures and write out some Ws. 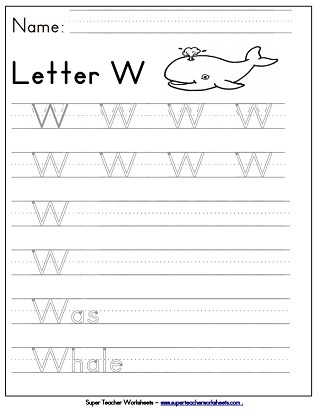 This worksheet is a good resource to practice writing out lower-case w.
Trace along the gray lines to learn to write lower-case w.
Students can practice writing capital letter W by tracing the dotted lines on this printable. Use this worksheet to allow your students to practice writing capital letter W.
Learn how to draw capital W and lower-case w, then write three words that begin with the w.
Use this worksheet to practice recognizing the letter W.